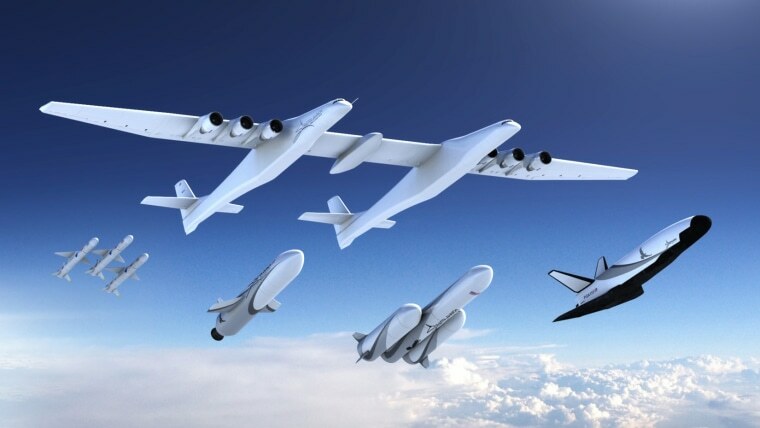 Paul Allen's "Stratolaunch" is designed to make spaceflight cheaper and more convenient. How do you get something from Earth into space? Most of the time, the answer begins with a rocket on a launch pad. Paul Allen has a different idea. The billionaire co-founder of Microsoft has built the world's biggest airplane — a twin-fuselage, six-engine beast with a wingspan wider than the length of a football field. He wants to strap rockets under the wings of the plane, fly them to 35,000 feet and release them, giving them a head start on their journey to space. It’s all part of a plan to lower the cost of spaceflight and make launching a satellite "as easy as booking an airline flight," according to Stratolaunch Systems Corp., the Seattle-based firm Allen founded to build the plane. The giant plane, dubbed Stratolaunch, is still in development at the Mojave Air and Space Port north of Los Angeles and hasn’t yet flown. But Allen's audacious air launch plan is starting to take shape. Stratolaunch Systems announced in late August that it would offer paying customers three different rockets designed to take payloads of different weights and sizes into orbit. The company also announced plans to build and launch a small spaceplane capable of carrying a yet-to-be-specified number of passengers. "I think the reusable spaceplane they are proposing — similar to many comparable concepts of decades past — makes a great deal of sense," said Gary Hudson, president of the Space Studies Institute in Mojave, California. "Prior projects failed due to the high capital cost of building a new carrier aircraft for the spaceplane, which is a problem that Stratolaunch has overcome, thanks to Paul Allen's commitment." Air launching offers certain advantages over conventional ground launching, including the ability to fly above or around bad weather and more flexibility in putting rockets into specific orbits. In the U.S., a satellite headed to an east-west orbit can only launch from the East Coast, since rockets can’t fly over populated areas during the initial phase of flight. Air launching overcomes these restrictions because the “launch pad” is portable. The technique has been used before. Northrop Grumman currently launches a 55-foot winged rocket called Pegasus from the belly of a modified jumbo jet. Pegasus can lift 815 pounds into low-Earth orbit; its last four missions have all been NASA science spacecraft. Stratolaunch Systems said it would start launching Pegasus rockets from its giant plane in 2020. Two years later, the company plans to debut its own rocket, a “medium-launch vehicle,” or MLV, capable of carrying 7,500-pound payloads — more than nine times the capacity of Pegasus. Artist’s concepts released by the company show the MLV as a wider, longer version of Pegasus with stubbier wings. Eventually, Stratolaunch Systems plans to develop a “heavy” MLV variant using two half-length MLVs as side boosters. That rocket would handle payloads of up to 13,000 pounds. Those capacities will place the rockets in an untapped region of the burgeoning commercial spaceflight market. For very small satellites, there’s Electron, a small rocket that blasts 500-pound satellites into space from New Zealand. On the opposite end of the spectrum is the SpaceX Falcon 9, which can lift more than 50,000 pounds. A current option for small-to-midsize satellites is sharing a ride with other customers, providing everyone is going to similar orbits, said Caleb Williams, a space systems analyst with the Atlanta-based aerospace company Spaceworks Enterprises. This could give Stratolaunch an opening: customers who need their own rocket but don't need something as beefy as a Falcon 9. "Those [customers] are likely to be military in nature, or have very precise requirements," Williams said. The Stratolaunch spaceplane looks like a miniature version of NASA’s now-retired space shuttle, with a white body and black belly. The company said it would carry cargo before people but didn’t specify whether the passengers would be astronauts bound for a space station, space tourists or both. Virgin Galactic, which is bankrolled by another billionaire, Richard Branson, has a similar concept in development: a vehicle called SpaceShipTwo that will carry tourists into space for a few minutes of weightlessness. But unlike Stratolaunch's spaceplane, it won't go into orbit. Before Stratolaunch Systems can put any rockets into space, of course, its giant plane has to take to the skies. The company hasn’t said when Stratolaunch will make its first test flight, and it declined to comment for this article. So far the aircraft has simply been rumbling up and down the Mojave runway, giving engineers a chance to test the plane's steering, braking and other systems. But Lori Garver, a former NASA deputy administrator who is now the general manager of the Air Line Pilots Association, said she was watching Stratolaunch with great interest. "Having several brilliant, multibillionaires invest a portion of their fortunes in this arena is either a signal of a potential robust future space transportation market, or a demonstration of these individuals' personal interests," she said. "Most likely a bit of both." Want more stories about space?